WHEN teacher Nor Zalila Hidayu Aman heard that her school was receiving sponsored copies of The Star’s Newspaper-in-Education (NiE) pullout, she was over the moon. “It is a blessing to us! We have not had much success with obtaining gadgets and we are not able to supply each student with a laptop. So this sponsorship is a much-needed resource,” said the English department head from SMK Kota Masai 2, Johor. The school is one of 40 Johor schools benefitting from the PPB Group Berhad sponsorship of the NiE pullout. The sponsorship by the Malaysian diversified conglomerate was made under Star Media Group’s English for Better Opportunities (EBO) project. NiE workshops for teachers and students were also included in this sponsorship to help teachers understand the methodology of using the newspaper as a resource to teach English. 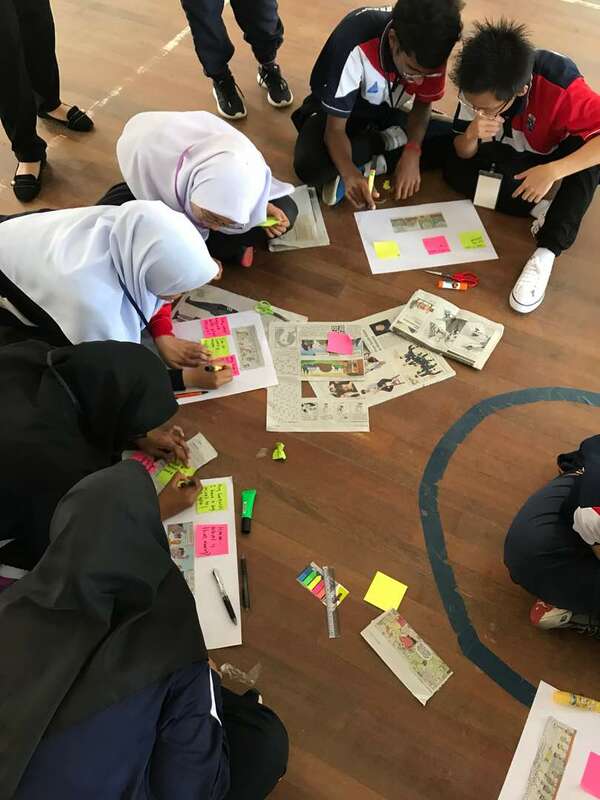 Having used the newspaper as a teaching tool before being introduced to NiE, Nor Zalila Hidayu is familiar with the benefits of using this authentic resource. NiE was part of an English camp at SMK Kota Masai, Johor. Students enjoyed the engaging and hands-on newspaper activities. “Not every student has flipped through an English newspaper. Some do not even know that you can find the comics in the newspaper. NiE exposes them to something new. “It helps most in building vocabulary. Students write better when they see examples of correctly written sentences. They can see authentic news reports in the newspaper. They also stumble on things that they are curious about and it would prompt them to question things. The Star-NiE programme, now in its 21st year, has been breathing life into English classroom lessons with engaging, hands-on activities using the newspaper. The colourful, syllabus-based 12-page pullout is written by a team of experienced English language teachers. Last month, SMK Kota Masai 2 hosted an English camp. Two other schools, SMK Tanjung Puteri Resort and SMK Seri Kota Puteri, were also invited to the camp. NiE activities were used as part of the camp acitivities. “The teachers who attended the earlier NiE workshops (for teachers) were the ones who suggested that we include an NiE session in the English camp. “Students liked the activities – they were very engaged and happy. “The students now look forward to English classes with NiE. They would ask if we are using the newspapers when we have English lessons,” she added. English teacher Siti Salbiah Salleh, who also attended one of the NiE workshops sponsored by PPB this year, enjoys using NiE in her classes. “NiE can be fully utilised to enhance a range of language skills. Furthermore, NiE is relatively inexpensive compared to other materials. She also likes the fact that the newspapers are visually stimulating. Form Two student Fara Nurumairah Kamaruzzaman said she finds that the newspaper has a lot of news and information to offer. She also liked the fact that NiE encourages group work. “I like working in groups because I can share my opinions and thoughts. The lesson is more exciting than when studying alone. Study groups encourage us to learn new skills and gain new perspectives. Student Syed Muhammad Azriel Syed Faizal, 14, said that NiE encourages him to read. “I never knew that the newspaper can also be useful for learning! I like using NiE in English lessons. Form One student Priyalatha Setha said that NiE encourages her to read the newspaper. “I was afraid to read English newspapers at first, but now I like reading them because they have many interesting sections. By reading more, I can improve my vocabulary as well as writing in English.